Welcome to the Portland Mint. Your home for all your copper investing needs. We specialize in providing investment grade U.S copper pennies. Both our products and our customer service are of unmatched quality. Pennies minted in the United States prior to the middle of 1982 are composed of 95% pure copper and 5% zinc. As a result, a copper penny is worth considerably more than its face value. Because pennies are made by the U.S mint, they are guaranteed to have the utmost quality and purity. This also makes them easily recognizable, which increases their demand and liquidity. 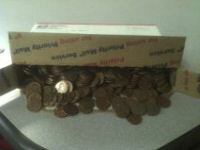 Copper pennies are an inexpensive and safe method of copper investment. Not only are they a commodity, due to their metal content, but they also are a currency. A single coin will never be worth less than face value, thus giving it a limited downside. Global demand for copper continues to rise, creating increased value for copper pennies. With global demand at an all time high and copper being the building block of development, the price should continually rise. Copper and nickel may not be precious metals, but they surely will become profitable metals. They are highly suited to ensuring your purchasing power as inflation accelerates. Expand the diversification of your safe haven investments today with profitable metals. 1 ton lots are available for delivery or held in our secure storage facility. 2200lbs U.S. nickels are available for delivery or held in our secure storage facility. We don't short our inventory and don't sell copper we don't have. You can trust that our inventory is 100% backed and is of the highest quality.